Adalet's JN4X series stainless steel enclosures are available in type 304 and 316L stainless steel with a brushed finish. 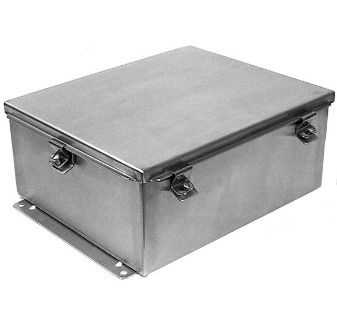 The enclosure has continuously welded seams ground to a smooth finish. Wall mounting back brackets are welded on the top and bottom outside. The JN4XHSS cover is sealed with a one-piece neoprene gasket and is secured to the enclosure with a continuous stainless steel piano hinge on one side and stainless steel door clamping hardware on three sides. There are no knock-outs or holes in the cover or body. A hardware kit is included.